Florida Citrus Sports and OPC are making a college football fans dream come true with the ultimate biggest and best tailgate crawl to downtown Orlando! 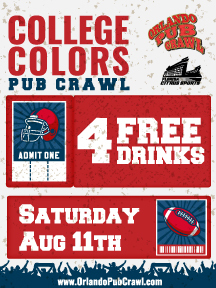 Football season is in the air so Florida Citrus Sports and Orlando Pub Crawl bring you their own special tailgate at The College Colors Pub Crawl.To learn more, please visit http://orlandopubcrawl.com/event/college-colors-pub-crawl/. Make sure you enter the code “nittanylion” when registering. Follow us on social media or email us at events@centralfloridapsu.com for chapter updates.